Home > Catering > Catering, Buffet or Sit Down Dinner? Feeding hungry guests at a wedding is essential to keep them happy so it is important to consider not only what sort of menu to go for but also what kind of catering to choose. One type of catering you can chose for your wedding is a sit down dinner. This is a traditional choice and is mainly used in venues such as hotels, manor houses and private marquees. Some places offer an extra silver service for your wedding day which adds extra class and sophistication to your day. It also enhances your guests’ experience of your day as it makes them feel a bit privileged and spoiled. A sit down dinner is popular for weddings because it is the option which is easiest for guests and allows them to sit and relax and enjoy their dinner. In most venues that offer a sit down dinner service, there is often a carvery option available which is essentially the same food but the guests have to go up and collect their dinner before sitting down. This is a good choice for couples on a budget as it is often up to £20 a head cheaper than the silver service option and still allows guests to have a full three course meal. It is not an ideal choice for large weddings as large queues may mean that guests are all eating at different times and not sitting down to enjoy the meal together but is a great option for weddings on a budget. 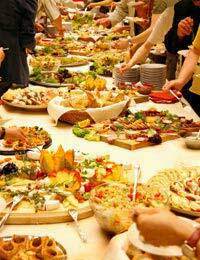 A buffet dinner is a cost effective and popular option for catering at a wedding as it is much cheaper than either a sit down meal or the carvery option and still ensures guests are satisfied and happily fed. The word buffet conjures up images of sausage rolls and mini quiches on paper plates but in today’s world, the reality can be very different. You can have a miniature version of most foods and a buffet is good if you have guests with a variety of food preferences as there is something for everyone. With a sit down dinner there are often only two or three options and there isn’t as much variety. Some couples, if the wedding party is large, will invite additional guests to the evening reception. As the evening guests miss the main meal, often there will be another buffet on late in the evening for them which is not essential but a nice touch for the guests. In terms of menu, it is important for the menu to suit the guest list and that any important dietary requirements and allergies are taken into consideration and that there is a vegetarian option for any non meat eating guests. Looking at all the options, there are no right or wrong choices, it just depends on individual circumstances and needs. A big deciding factor is budget as there is a huge price difference between a sit down dinner and a buffet option and also the size of a wedding party has a big influence on the type of catering required. Whatever style of catering you choose, you will still have a day to remember.